Sometimes, it’s the little unplanned events that happen on the spur of the moment that make the best memories. Summer vacation started on Friday at 3:15 pm and it’s been a pretty good start so far. 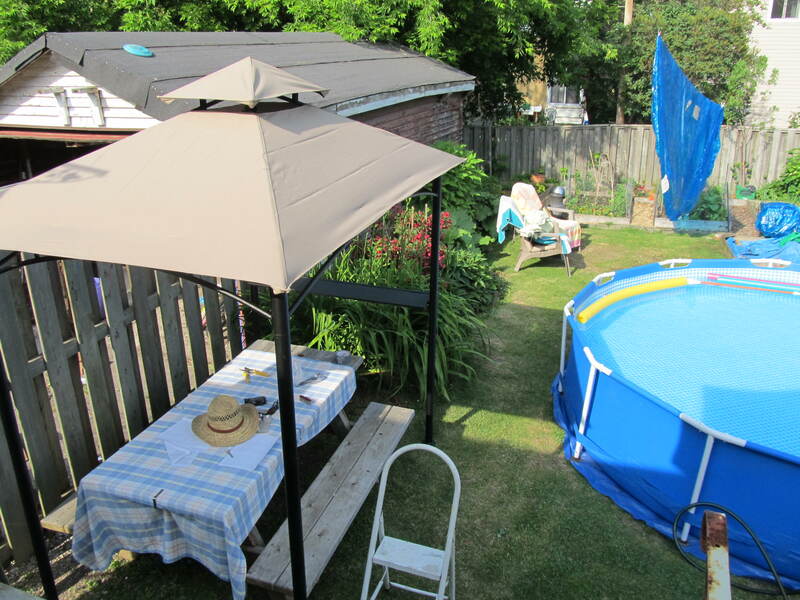 We had tennis lessons, a birthday party, a visit or two, and we set up the backyard pool and a new canopy for shade over the picnic table. Which is where I’m sitting right now typing…this, ladies and gents, is my new office. We are not the kind of people who enjoy being solicited to. We never, ever respond to unsolicited advice and DH in particular is especially keen on collecting and researching all pertinent information on a specific product or service on his own time at his own leisure, before we go out and talk to experts or sales personnel. We never, ever buy things at the door, sent to us by email or direct mail. Anyone who thinks we are more inclined to try something or buy something by saying words that begin with “you must” or “you should” or “you have to try” is guaranteeing that we will never get that thing at all. And don’t even think of calling us on the phone…. If we ask for advice, then yeah, sure, I may take you up on a suggestion. I know already that the kind of fridge I want for my new kitchen is currently being used by friends of ours, and I will pester them for information when the time comes to purchase our own new fridge. Their advice will be invaluable and if they are willing to give us some, then I will welcome it. But to solicit us in our home, uninvited, um…no. Don’t do that. Winter has been long and cold. I long for some greenery.